When intelligence is required for you to do your job, as it is for a peacekeeper, who you know is often times far more important than what you know. Such was the case in Star Wars Episode II: Attack of the Clones. The Jedi Order had access to all kinds of information dating back to The Old Republic but when Obi Wan Kenobi needed to discover the origin of an assassin's poisoned dart, all roads were turning up as dead-ends. That is, until Kenobi turned to his old friend Dexter Jettster. Dex owned his own diner - appropriately named Dex's Diner - on Coruscant and had a healthy knowledge of the goings on throughout the galaxy. Jettster, a Besalisk, was in a profession that a member of his species could easily excel in, given four arms and the dexterity that would go along with that. Plus, as a cook, much like would be the case with a bartender, Dex would be privy to a number of conversations about many topics on the regular, often times a direct result of being "just a fly on the wall" in his own establishment. Dex was able to call on his past experiences - of which little is actually known - and perhaps information that he learned thanks to the popularity of his diner in Coco Town to help his Jedi friend out. Luckily for Kenobi, Dex knew exactly where the dart came from and sent the Jedi Knight on his way towards the cloning facilities on Kamino, along with a warning to bring some money along on the trip. 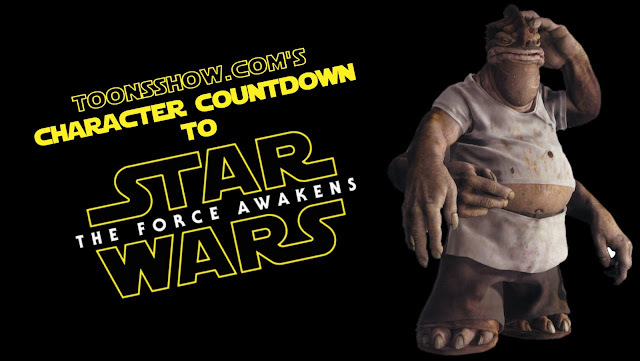 Stay tuned throughout the lead-up to Star Wars: The Force Awakens as ToonsShow.com counts down the days with a brief introductions to some of the lesser-known characters from the Star Wars Expanded Universe.